Bernardus Agumba stands with Selvin Odhiambo, his neighbour and relative, next to his cow in Homa Bay county, Kenya (photo credit: ILRI/Muthoni Njiru). Among the Luo of western Kenya, community is highly emphasized. Cultural and social attributes encourage joint development and support for those bound by blood or association. Selvin Odhiambo, wife and mother of six, sought the assistance of her neighbour and relative, Bernardus Agumba. 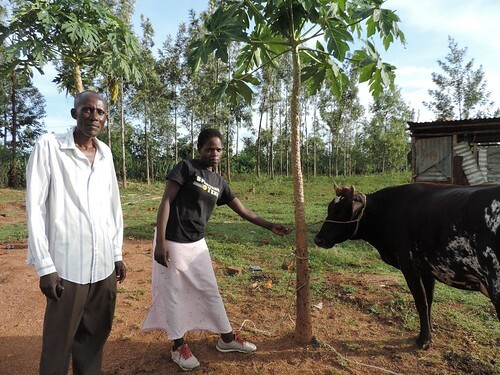 As part of a United States Agency for International Development (USAID)-funded subsidized breeding program, he agreed to lend one of his four cows to Selvin in order for her to start up her dairy farming. With four healthy dairy animals, he felt the need to support his neighbour in whatever way possible. The cow has now benefitted from the breeding program, delivering a female calf that will allow Selvin to produce milk for her home. Selvin Odhiambo with her new calf (photo credit: ILRI/Muthoni Njiru). In April 2017, Selvin received a healthy crossbred calf from her neighbour’s cow after a successful pregnancy from Fixed Time Artificial Insemination (FTAI). The sheer excitement in her eyes displays how Agumba’s generosity has opened a new opportunity for her and her family. ‘By leveraging and supporting existing cultural platforms, farmers are helping themselves become more food and income secure. Our program is not only increasing productivity in the community but is also improving the livelihoods of these households,’ says James Rao, team leader of the Feed the Future Kenya Accelerated Value Chain Development Program, that supported the local insemination program. With the availability of quality veterinary services, and access to ‘shared’ animals, communities and farmers can assist each other. For instance, if one farmer has a number of dairy animals but only has the financial ability to serve one or two animals, the farmer can allow their relative or friend to use one of the other cows to benefit from the breeding opportunity presented by the USAID-funded program. Traditionally this was a way of spreading risk, if hardship or tragedy befell one’s herd some of the cows shared/lent to friends or relatives would be spared, thus giving a chance for the farmer to restart his/her livestock rearing enterprise. 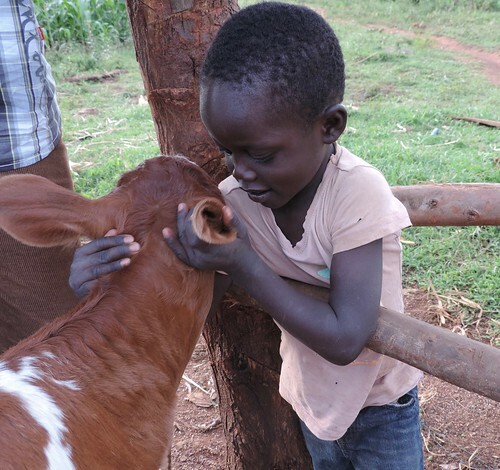 Selvin Odhiambo’s son Hilary with the calf (photo credit: ILRI/Muthoni Njiru). 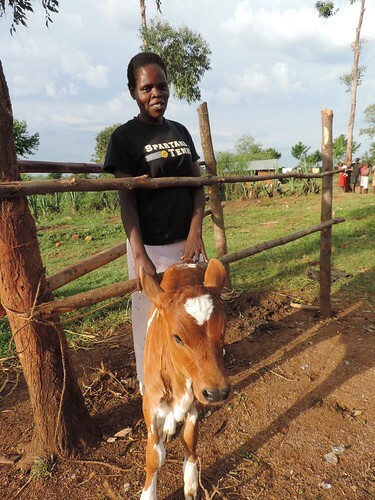 ‘This calf will help both families, I will also benefit from the milk from this calf in one way or another,’ said Agumba. Other development programs in the region can also leverage on existing cultural and social platforms that can perpetuate our efforts of improving the lives of smallholder farming families there. Farmers have local knowledge, but limited resources, we can provide necessary support to help them help themselves; this is the future of development. Tags: Dairy. Bookmark the permalink.